Left Hand Robotics has developed the first self-driving robot to clear snow from sidewalks, dramatically reducing labor expense for snow management operators while producing better overall results. Tedious, repetitive, physically taxing snow shoveling is the ideal task for a robot. SnowBot Pro pilot customers across North America are responsible for snow management at hospitals, airports, business and academic campuses, retail shopping centers, and local municipalities. A job that typically takes eight snow shovelers an hour to clear is completed in the same amount of time with one SnowBot Pro. Customers see the SnowBot Pro as a way to significantly reduce their labor costs, clear snow faster, and improve safety -- as one in four slip-and-fall accidents is attributed to snow and ice. State-of-the-art technologies enable the GPS-navigated robot to operate autonomously to clear snowy sidewalks with down-to-the-inch accuracy. It has five types of sensors, including LIDAR and thermal sensors for safety. Customers monitor the robot’s progress in real-time from the web or mobile phone apps. "Commercial snow removal companies know they have to do something about their high and very unpredictable labor expenses. When they see how our robot automates their most labor-intensive task, they embrace it," says Terry Olkin, CEO of Left Hand Robotics. Based on demand for the upcoming snow season, the company is getting ready to ramp up production for Fall 2018 delivery with a base price of about $32,000 plus an annual software subscription. Early on, the company received $1.7M from angels and early Left Hand Robotics champions including Matt Robinson of Heroic Ventures and Keith Nilsson of Xplorer Capital. "The Left Hand Robotics team is impressive - decades of experience in software, automation and robotics - they're guiding traditional industries into automation that are ideally-suited for robots." says Robinson. With the success of the pilot robots in the field and a growing reservation list, Left Hand Robotics will be first to market with a commercial-class robot that addresses high labor costs, the single biggest pain point for the $24B North American snow management industry. The company's planned capital raise in early 2018 will ramp production and grow the team. Left Hand Robotics has developed the first commercial self-driving, snow clearing robot capable of removing snow from sidewalks. The SnowBot Pro is a state-of-the-art GPS-navigated robot that operates autonomously to address the biggest problem commercial, residential and municipal snow management operators face – the high, unpredictable cost of labor for snow shovelers. Based in Longmont, Colorado, Left Hand Robotics was founded with a vision to bring safe, robust, and innovative automation and advanced technology solutions to outdoor industries thus allowing businesses to scale by reducing costs due to labor. The Left Hand Robotics founding team brings over five decades of experience in software and robotics to difficult problems such as snow removal. 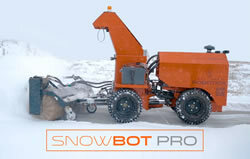 The SnowBot Pro is available for the 2018-19 snow season.